Spring (April-May) and autumn (mid-Sept-Oct) are the best times to visit the lower Himalaya as summer brings ferocious heat followed by the breaking of the monsoon. On the other hand the higher routes are only open for a few late summer months each year. As you might expect winter in Tibet and Ladakh is bitterly cold – the average temperature in Leh is below freezing for more than half the year. Whatever the season, mountain weather is always unpredictable so it's best to be prepared for blistering sunshine and frost-biting cold. Arab sailors were the first to name a seasonal wind sweeping over the Arabian Sea trailing downpours in its wake; they called it the mausim. Today the monsoon, as it is now known, is more closely associated with the Indian subcontinent and its unchanging cycle of drought and flood. The monsoon season usually starts in mid-June as the first rains hit the coast of South India. Over the next few weeks clouds trundle steadily northwards towards the Himalaya, dousing everything along their way. The rains reach Islamabad and Delhi in early July; the leaden monsoon clouds and enormous thunderstorms that announce their arrival make for an ecstatic release from weeks of white-hot skies and deadening heat. The rains are generally spent by mid-September. During the monsoon season humidity is very high though the rain itself usually only falls for a couple of hours during the afternoon, followed by bright sunshine which sets the earth steaming. While fungus might grow on your clothes, monsoon season in the Indian subcontinent is an interesting time to visit, if not necessarily to travel. But in remote areas dirt roads turn into mud baths and where glacial streams flow across metalled roads (Spiti, Manali-Leh, Friendship Highway) they can rip away the tarmac leaving a bed of loose rocks. Usually the Indian Himalaya block the monsoon clouds but in recent years even Ladakh and Spiti have seen heavy rainfall and floods in July and August. Among other meteorological factors all these timings are dependent on snowfall; both the thaw and the return of winter which can vary by up to a fortnight from one year to the next. Depending on the snowfall, spring and autumn are the best times to set off from Islamabad as between May and July temperatures exceed 40ËšC/104ËšF; for most people this is just too hot when the first week is so hilly. After the heat come the monsoon rains from July to mid-September. In high summer Indus Kohistan as far as Gilgit can get dangerously hot with temperatures rising above 50ËšC/ 122ËšF; avoid cycling at this time if you can and if you can't be sure to carry enough water. Even at night the temperature only drops to around 35ËšC/95ËšF and as few hotel have air-conditioning it's often difficult to sleep properly. From Gilgit northwards the climate is cooler and depending on snowfall the Khunjerab Pass can be blocked until early May. Spring (April-May) in northern Pakistan is especially pretty as the cherry trees burst into blossom, painting valleys such as Hunza a delicate wash of pink. However, the weather can still be unsettled with cloudy days of rain or snow. Post-monsoon, the skies in autumn (October-November) are clear and blue with perfect mountain views and pleasant temperatures. 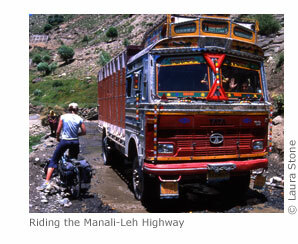 The Indian army does its best to keep the Manali-Leh Highway open between 15 June and 15 September. Sometimes nature does its best to keep them busy by snowing out of season, swelling rivers which wash away bridges and smothering the roads in landslides. The state buses and 4WD jeeps will run as late into October as they can (usually mid-October) before snow blocks the highest passes until next summer. The Indian army also maintains the Leh-Srinagar Highway which, although much lower than the Manali-Leh Highway, experiences higher snowfall. The road usually opens in May though late snows can block it until June. Likewise, it should officially close at the beginning of October but in some years has stayed open until mid-November. Kunzam La (4550m) is the only pass into Spiti and is usually free of snow by July but snowbound once more by the end of October. Kunzam La is at the western end of the Spiti valley; to the east there are no passes at all which means that Kinnaur and Spiti (as far west as Losar) should be reachable year-round from Shimla. However, during summer the entire region is prone to landslides that can close the road for days and cut off entire valleys. Sikkim's elevation leaps about from a hot and sticky 315m (Rangpo, the entry point to Sikkim) to an arid and breathtaking 4996m (Gurudongmar Lake) so the climate varies wildly even within one riding day. From January to April you can expect cold (but not freezing) weather with some sun during the day and clear views of the mountains. In April there are occasional showers and by May the showers have increased and the mountains are often hidden in haze. June and September have showers mixed with good weather but views are hazy. The monsoon drenches Gangtok throughout July and August but by October the rains are done and the weather is crystal clear with mountain views that just get better as temperatures drop into November and December. Winter (December-February) in Tibet is extremely cold and dry with correspondingly great views. But the high passes are often blocked by snow and unless you have proper equipment and experience in sub-zero temperatures it's just too risky. Spring (March-May) is exceedingly windy with sandstorms so unpleasant that cyclists have resorted to riding at night when the winds drop. By summer (June-August) the winds ease, the thermometer climbs above freezing but now the rains begin, flooding the rivers which in turn make some roads impossible to ford even for 4WDs. By far the best season is autumn (September-November) as the rains have usually retreated by mid-September but you still have the advantage of long daylight hours. October is the best month for views, temperature and daylight; by the end of November the daylight hours are short and the nights and passes are extremely cold. Bhutan has a reputation for cloudy weather for which it can blame neighbouring Assam, the wettest place on the planet. Like Sikkim, the weather isn't extreme but passes can be cold. A Bhutanese visa is cheaper (by $35 per day) during the monsoon months of July and August but for the best chance of clear skies and beautiful views visit in November or December.